There’s something about slow mornings, when you wake up with plenty of time to sip your matcha and munch on a bowl of oats, that helps you feel extra prepared for the day. But most weekdays (let’s be real), you’re so time-strapped you normally have to choose between brushing your hair and eating breakfast. You’ve heard a million times that breakfast is the most important meal of the day, but according to holistic nutritionist Tara Miller, it can have a bigger impact on your day than you think. To help you tap into that brain fog-busting power (without being late for work every day) try this time-saving hack. With Purely Elizabeth®’s single-serve Vibrant Oats Cups, which are now available at Target, it’s never been more convenient to up the wellness factor of your a.m. routine—thanks to the potent superfood powders inside that paint your bowl of certified gluten-free oats. 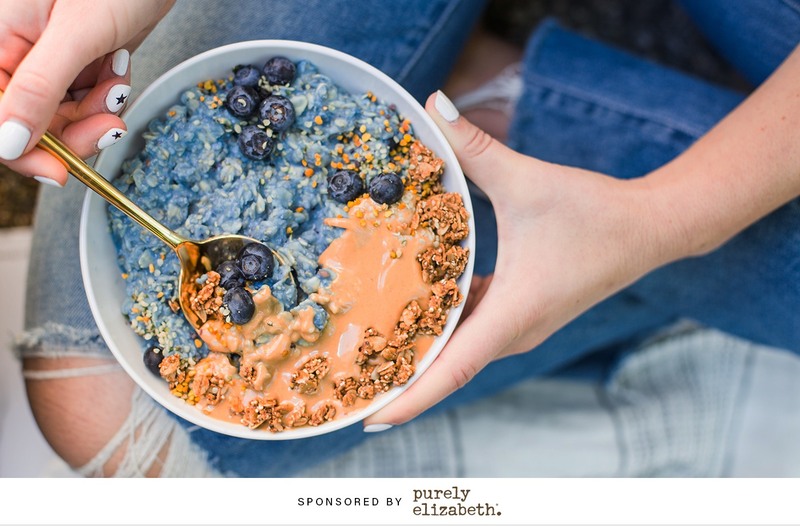 “We wanted to introduce something fun and unique with delicious taste appeal into the dated oatmeal category,” says Purely Elizabeth founder Elizabeth Stein. “We played off of the unicorn-food trend, adding pitaya, blue spirulina, and turmeric for added antioxidant and anti-inflammatory benefits. Plus, who doesn’t love unicorn food IRL?” She has a point. Scroll down for 3 reasons to add superfood oats to your a.m. rotation—and why you should swing by the breakfast-and-cereal aisle the next time you’re in Target. By noshing on a cup of Vibrant Oats, you’re loading up on superfood powders that you likely wouldn’t get at mealtimes—without a visit to the smoothie bar. And the benefits are major. The ocean-hued spirulina, a blue-green algae, packs in amino acids and omega fatty acids—whereas the saturated pink of pitaya powder (from dragonfruit) offers up immunity-boosting vitamin C and free-radical-fighting antioxidants. Golden turmeric, AKA the wellness booster you sprinkle over every dish while cooking, is known as a superstar inflammation fighter and immunity booster. “Those crazy rainbow and sprinkled lattes all over Instagram were [our] inspiration, but instead of adding artificial food dyes and flavors, we get our colorful hues from an array of superfood powders,” Stein says. Slow clap for real food. As a convenience lover, there’s no doubt you dig moseying through Target and picking up products that make your life easier (ahem, dry shampoo). So the next time you’re stocking up, you’ll want to pick up all three varieties of Vibrant Oats for those mornings when you hit snooze way too many times. You can turn the ready-in-an-instant oatmeal cups into a hot breakfast (perfect for chilly fall mornings) by pouring in hot water or nut milk, or simply microwaving. For a make-ahead option, stir in your favorite nut milk the night before and set it in your fridge to soak overnight. It’s the easiest version of meal prep, ever. Running out the door and calling your coffee breakfast is a timesaver, sure, but when you’re hangry at the office by 11 a.m. (and struggling to focus) you’ll probably be wishing you had eaten something a little more filling. Bump up the decadence of your oats with a generous drizzle of the warm nut butter of your choice, top with a generous portion of Purely Elizabeth Original Ancient Grain Granola (that comes in the lid for added crunch and nutrition), and breakfast is served.